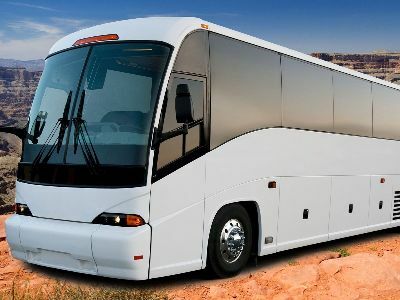 All Grand Canyon bus tours from Las Vegas that we recommend here are conducted by safe, air conditioned motor-coaches/buses and conducted by professional drivers who are also tour guides. Whether you enjoy action and hiking, or relaxed and informative tours, you will find something that interests you. 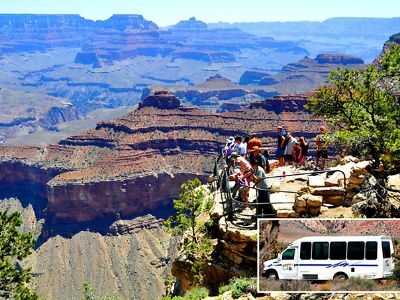 This is one of the most popular, easy and complete Grand Canyon bus tours from Las Vegas to the West Rim, perfect for kids and adults alike. The tour includes everything you may wish to see at the West Rim, including the best viewpoints of the canyon and a visit to the Hualapai Ranch where you will be greeted and entertained by the Indian population. On the way to the canyon, stop at the O'Callaghan-Tillman Bridge near Hoover Dam. As it's a pretty long day trip, light lunch is included. 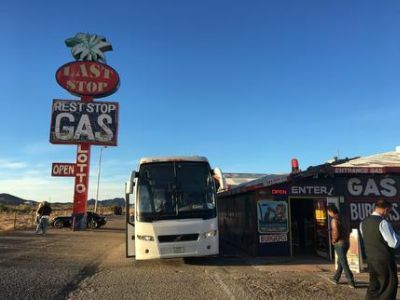 These Grand Canyon bus tours from Las Vegas by luxurious mini-coach or SUV are hands down the most comprehensive and stunning bus tours the city's got to offer! During this trip you will visit the beautiful Hoover Dam, both Guano Point and Eagle Point of the West Rim, watch the Indian ritual dance and a cowboy show at the Hualapai Indian Ranch, take a wagon ride, visit the native Indian Market where you can get some jewelry and souvenirs. For extra $35, you can take a horseback ride and for another $35 - visit the magnificent Skywalk bridge to get a 360 view of the Grand Canyon. After you get picked up from your Las Vegas hotel, a luxury coach/bus will first take you to the Hoover Dam where you will have about 15 minutes to take in the sights and take pictures. Then the bus will head off towards the West Rim of the Grand Canyon. At the West Rim, you will have 4 hours to yourself - it's up to you to upgrade the tour to take the helicopter, boat or Skywalk options. 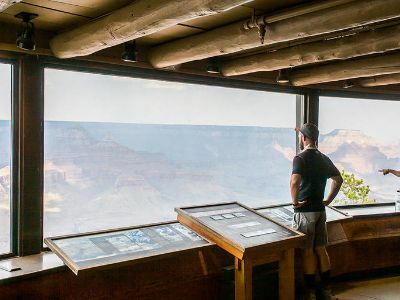 West Rim attractions that you are free to explore include: Eagle Point for panoramic views of the Grand Canyon; Hualapai Ranch, Guano Point for some breathtaking views of the Colorado River. This is one of the most exciting Grand Canyon bus tours from Las Vegas - you will be able to experience the best that the Grand Canyon tours have to offer: a helicopter descent to the bottom of the canyon, a boat ride and a Skywalk! Your tour starts with a hotel pick up, then a comfortable air-conditioned bus will take you to the West Rim of the Grand Canyon. There you will enjoy a very slow 4,000 feet (1,200 meters) helicopter descent to the floor of the Grand Canyon, where a boat will be waiting for you to give you a 15-minutes ride on the Colorado River. After the boat, you will board the helicopter again for a slow ascent back to the Rim. 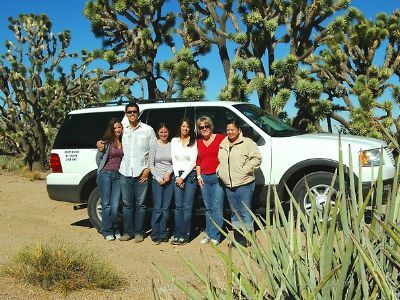 After that, the bus will take you to the Guano Point and Eagle Point where you can take pictures and purchase memorable gifts. Then you will stop at the Hualapai Ranch for a complimentary lunch, and head back to Las Vegas! 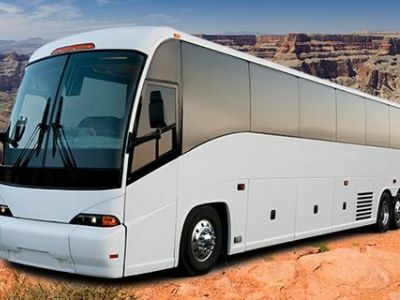 This exciting Grand Canyon bus tour from Las Vegas will take you to the South Rim with a stop at the National Geographic Visitor Center where you will have time for lunch and will be able to watch the incredible IMAX movie The Grand Canyon Discovery and Adventure by National Geographic. The movie includes footage of the Grand Canyon taken from the Colorado River and from air. At the South Rim, you will be able to take a hike and view the Grand Canyon from two lookout points: Mather Point and Bright Angel Lodge. You can upgrade this tour to take a 35-minutes helicopter flight! 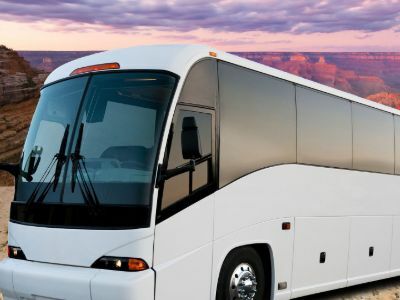 These VIP Grand Canyon bus tours from Las Vegas will pick you up at your Las Vegas hotel and will take you to the South Rim over the Hoover Dam Bypass Bridge. The bus will make a stop at the Hoover Dam, where you can take pictures before heading off to the Grand Canyon. The bus will stop at Bright Angel Lodge located at the South Rim, where you will have lunch and enjoy 3 hours of freedom! You can take free shuttles to other observational points located nearby, such as Mather Point or Yavapai Point, or take a hiking tour of the South Rim. 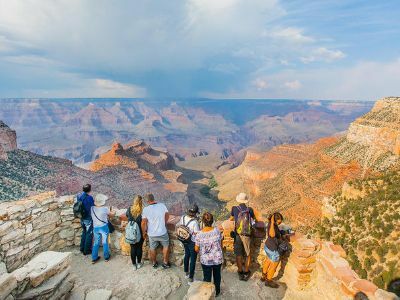 An ideal way to get out of the city for a day and visit one of the most spectacular places on earth is to try the Grand Canyon National Park Bus Tour. The 15-hour adventure starts with complimentary pick-up service from your hotel where you will be transported in a luxury motor coach. Along the way you will make a 20-minute stop at the Hoover Dam for photographs before continuing your journey along the historic Route 66 to Williams, Arizona before you reach the Grand Canyon. Once at the South Rim of the Grand Canyon, you will make stops at the Bright Angel Lodge to visit the historic El Tovar Lodge, take photographs and walk the canyon rim at Mather Point and there is plenty to see at Yavapai Point including stellar views of the Colorado River. You will spend approximately 3-hours at the Grand Canyon during this Grand Canyon bus tour from Las Vegas . Added bonuses on this tour are complimentary light snacks, lunch and bottled water. Your excursion concludes with drop-off service back at your Las Vegas Hotel. 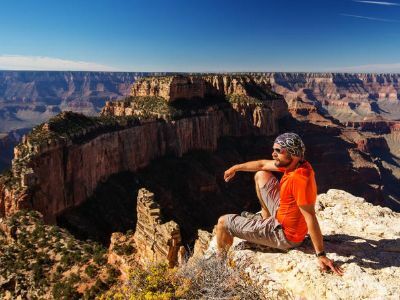 If you are interested in spending the day within one of the greatest natural landscapes on the planet with plenty of additional opportunities for fun, then you should try the Grand Canyon South Rim Bus Tour with Optional Upgrades. Your 15-hour excursion begins with complimentary hotel pick-up service where you will then be transported to Grand Canyon National Park. Along the way you will listen to great commentary on the luxury motor coach from your expert guide and view interesting desert landscapes. Once at Grand Canyon National Park you will stop for a free lunch at the National Geography Visitor’s Center. After lunch there will be time to explore the interactive exhibits on the canyon and learn more about the geology, wildlife as well as history of the Grand Canyon. Form here you will make two 1.25-hour predetermined stops. At Mather Point you can take numerous photographs of the intriguing canyon carved out by the Colorado River before stopping at Bright Angel Point where you can view the historic El Tovar Lodge. There are some great add-on options you can indulge in on this tour to make for a full fun day of exploration. The first upgrade is a ticket to the IMAX Theater within the visitor’s center. The movie is an excellent way to make you feel like you explored the canyon like John Wesley Powell. The second upgrade is a 2-hour Hummer adventure where you will go to Duck on a Rock as well as Moran Point or Duck on a Rock with Yavapai Point. The third upgrade is a 2-hour jeep ride through the area where you can view the stellar geologic formations and take numerous photographs at Grandview Point. Also included on this upgrade is a ticket to the IMAX Theater movie. Your last upgrade option for this Grand Canyon bus tour is a thrilling 25-minute helicopter ride through the canyon where you can enjoy in bird’s eye views of this incredible place. Your tour concludes with drop-off service back at your Las Vegas hotel. A visit to Las Vegas is not complete without taking a side journey to one of the Seven Natural Wonders of the World and the Grand Canyon South Rim Bus Tour is an ideal way to go. Your 15-hour journey starts with free hotel pick-up service where you will board a luxury motor coach and be transported to the park. During your drive you will have perfect views of the Mojave Desert and other incredible scenery while you listen to expert commentary from your guide about the history, natural landscape and culture of the area. Before you enter the park, you will stop and indulge in a complimentary lunch and then head into Grand Canyon National Park. Once inside you will make two 1.25-hour stops. The first stop is at Mather Point for breathtaking views of the colorful and interesting canyon that has been carved out by the Colorado River. Your second stop is at Bright Angel Lodge. Here you can hike a portion of the trail leading down into the canyon as well as visit the historic El Tovar Lodge. Your exciting Grand Canyon bus tour from Las Vegas concludes with drop-off service back at your hotel.